A Dynamic Microphone works on the principle that if a conductor cuts a magnetic field, emf is induced in it. Sound waves striking a diaphragm cause a relative movement between a magnetic field and a conductor, there by inducing a voltage in the conductor. The figure shows the simplified construction of a moving coil dynamic microphone. An aluminium foil is used as a diaphragm, one side of which is exposed to sound waves. On the other side of this diaphragm is attached a light weight former with a small coil wound over it. 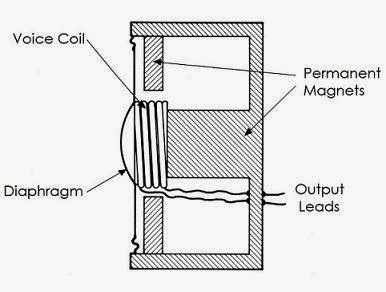 The coil is situated in the magnetic field produced by a strong permanent magnet and is free to move in the magnetic field. Sound waves striking the diaphragm cause it to vibrate, giving to and fro-motion to the coil across the magnetic lines of field and inducing alternating voltage in the coil. The AC signal produced has a frequency equal to the frequency of vibration of the diaphragm. Amplitude of this signal is proportional to the extent of the diaphragm vibrations and hence on the intensity of sound waves. The dynamic microphone has a flat frequency response in the range of about 60 Hz to 10 KHz. It does not require any polarizing battery for its operation. It can be built to have a light weight, small size and rugged construction at a comparatively low cost. Depending upon the intensity of sound waves, the signal output of this microphone loes in the range of -30 to -80 dbm (0 dbm = 1 mW). The moving coil microphone has very low impedance, that is, in the range of a few ohms only. A step-up transformer is, therefore, always incorporated in the microphone casing to increase the impedance level, thereby matching it to the input impedance of the circuit where it is used. Another important microphone that operates on the principle of magnetic induction is the velocity-ribbon microphone. Figure shows the constructional features of this microphone. In the ribbon microphone, the magnet is mounted below the pole pieces. The ribbon is made of very thin and pure aluminium foil, which is corrugated to give flexibility and prevent curling. This thin metallic foil ribbon is placed between two elongated pole-pieces. The ribbon acts as the diaphragm as well as the conductor. The ribbon has an extremely small resistance (usually less than 1 ohm). The pole-pieces are shaped to provide a cavity on each side of the ribbon. These cavities are broadly resonant and ensure that the high frequency response is maintained. The extremely low impedance ribbon necessities the use of a step-up transformer, similar to the dynamic microphone and a transformer is, therefore, invariably incorporated in the microphone housing. If certain materials are mechanically deformed by bending or twisting, a difference of potential is produced between the faces of the material. This is termed as the Piezo-electric effect and is exhibited by crystals of quartz. Rochelle salt and few other materials. Rochelle salt (sodium potassium tartrate) is much more sensitive than quartz and is, therefore, commonly used in crystal microphones. These plates of the material are cut from the crystal of Rochelle salt and are coated with a conducting material on their large faces. Two such plates are joined to form a pair with inner conducting surfaces being in contact and forming one of the output points, as shown in figure. The two outer faces are joined together and form the second output terminal. Such an arrangement is termed as bimorph element and is found to be more sensitive than a single crystal. Microphones employ bimorph crystal elements in different forms. In one form of crystal microphones, a pair of bimorph elements is fixed in a frame parallel to each other, with a small distance between them. The inner cavity is made air-tight. The arrangement is termed a sound cell. In another form of microphone, the sound pressure is made to act on a diaphragm, rather than the crystal elements and the diaphragm is made to actuate the crystal unit. This form of microphone gives larger output, because the diaphragm can be designed to provide matching between relatively low impedance of the air and the high impedance of the crystal. Crystal Microphones exhibit high capacity impedance and can be directly connected at the input circuit of a JFET or tube amplifier. The Capacitor Microphone operates on the principle of a change in the capacitance. When subjected to incident sound waves. Figure gives the simplified representation of a condenser microphone. The capacitor microphone consists of a thin light metal alloy diaphragm and a heavy metallic back plate. These two act as the plates of a parallel plate capacitor. The stretched diaphragm is of circular shape and is clamped around its edge. The diaphragm is positioned in front of the back plate but is insulated from it. A DC polarizing potential is applied across the capacitor plates. The alternating pressure of incident sound waves on the diaphragm causes it to vibrate. This gives rise to an alternating change in the capacitance of the microphone and causes an alternating voltage to be developed across the microphone, provided the load resistor R is large enough to prevent appreciable change in the charge on the microphone electrodes. The alternating voltage across the microphone due to changing sound pressure is equal to the voltage across the load resistor R.
The capacitor microphone has a very low output as compared with the carbon microphone and requires amplification. The output is relatively free from non-linear distortion and has a fairly uniform response. The microphone has high and capacitive impedance. A very commonly employed capacitor microphone is called the electret microphone and is employed in most of the commercially available magnetic tape-recorders, because of its extremely small size. A junction field effect transistor is always included in the electret microphone capsule to raise the signal level.